Since returning from Europe, I’ve been…how should I say? Aggressively eating. Aggressively would probably be putting it lightly. Aggressively writing? Not so much. With all of the amazing meals I’ve been lucky enough to enjoy in the past two months, I could probably write epic articles about fancy shmancy dinners until the end of the year. But you know what? Sometimes you just have to put all of that elegance aside and write about a damn good sandwich. Friends, family, today I want to talk about a chicken sandwich. Not just any chicken sandwich! Oh no my friends, I’m talking about 3-SUM EATS’ double patty, cornflake-crusted chicken sandwich served with old bay aioli, carrot-cabbage slaw, and of course, pickles. A sandwich stacked so high that I’m 0 for 3 on successfully getting my mouth around the entire package on that first bite. It’s a sandwich so large that for any average, sensible person, it could serve as both a satisfying lunch and dinner. Suffice to say, this is not a dainty sandwich. But dear god is it delicious. After merely three experiences, my mouth has instinctively begun to salivate at the mere thought of this roving food truck stopping near my office at lunch. I still don’t quite understand how something so simple can have that sort of power. Maybe the secret is in the execution? Since everything is cooked to order, that cornflake crust never has the time to get soggy or soft – when eaten on the spot, it’s perfectly hot and crispy every time. A healthy helping of not-over-mayonnaised slaw combined with the acidic tang of strategically placed pickles, transforms this classic sandwich into something that will undoubtedly leave you dreaming of going back for more. Some words of advice: don’t be misled by 3-SUM EATS’ “food truck” status, or by Ryan Scott’s Top Chef notoriety. 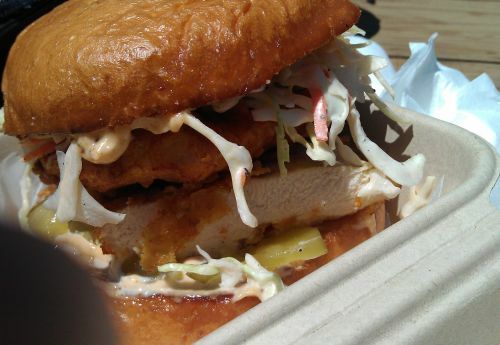 This sandwich is in the major leagues and can go head to head with any other local favorite. Oh, and come hungry. Very hungry. I dream about this sandwich.